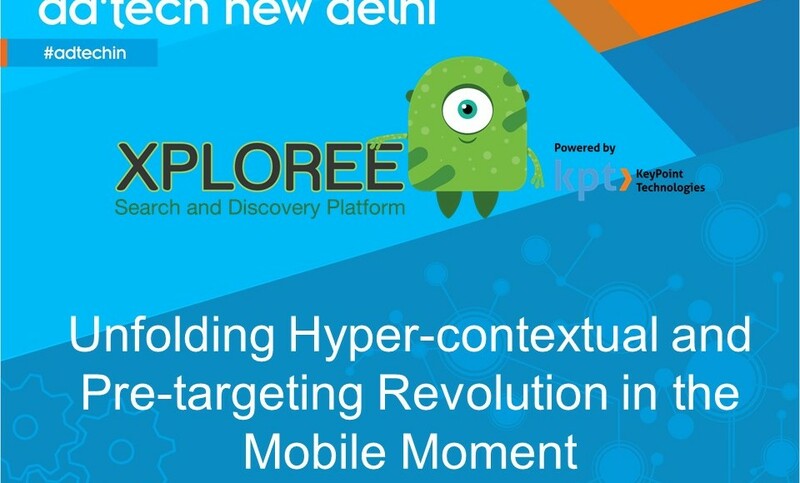 KeyPoint Technologies is exhibiting their latest innovation Xploree Search and Discovery Platform at ad:tech New Delhi on 19th and 20th of March 2015. We are also participating at the think:tech session on Friday 11am to 12 pm titled Hyper-contextual Pre-targeting Revolution in the Mobile Moment. If you have been excited about how context-aware technologies are gaining ground to unlock the potential of a brave new digital world, then our session aims to delight you. During our talk you’ll get a glimpse of how hyper-context and pretargeting can help businesses target customers with more relevance than ever before. Users on mobile have an expectation to getting information in their immediate moment of need. Are brands and businesses leveraging these ‘mobile moments’ and reaching out their customers at the right moment, in real-time? The disruption merely begins here; how about predicting your users’ needs in the next moment and serving information that they might not have even searched for? Experience how Xploree is bringing delight to user experience on mobile in an un-interruptive and rewarding way. In the end, customers whose wants are served in their moment of need are much likelier to feel valued, rewarded and engaged. For brands and businesses, higher consumer engagement translates to greater brand loyalty, stronger relationships and deeper trust.